1.In a 9-in. 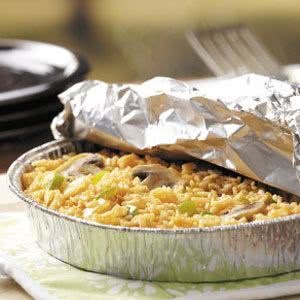 round disposable foil pan, combine the first seven ingredients. Dot with butter. Cover with heavy-duty foil; seal edges tightly. 2.Grill, covered, over medium heat for 12-15 minutes or until liquid is absorbed. Remove foil carefully to allow steam to escape. Fluff with a fork.